Paypal Mass Payment – How to Use! 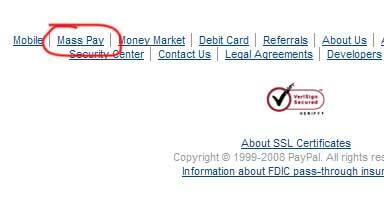 I’ve noticed not a lot of people know what Paypal Mass payment is or how to use it. Even a few eBay and Paypal experts that I’ve known for awhile have never used it before. I can understand why though, Paypal doesn’t actively talk about it like they do every other feature on their site. But it’s pretty easy to use and it can even save you a ton of money! 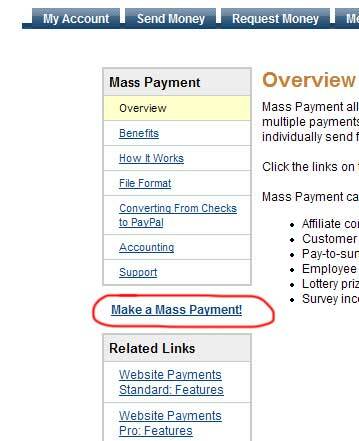 To find the Mass Payment link, simply scroll down to the bottom of any page in Paypal and click on ‘Mass Pay‘. Okay so what is Mass Payment? Basically it’s a way for you to send multiple Paypal payments or just a single payment with a very minimal fee. For example: I sent over 2k to a friend of mine a few weeks ago, I used Mass Payment and it only cost me $1 to send and Nothing for him to receive! 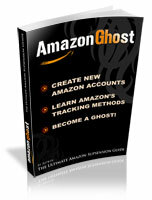 You can send to just one person or to many people very easy. 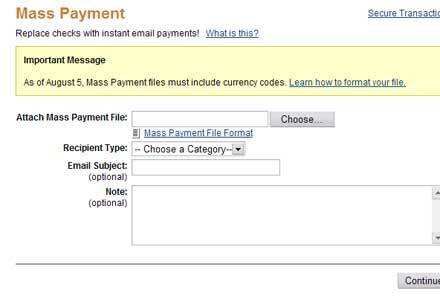 Click on ‘Make a Mass Payment‘ to continue. Okay here’s the tricky part. It’s not the usual what’s the email address and dollar amount you want to send. You need to upload a tab delimited file for things to work. Basically if you want to send $50 to Bob who’s Paypal email address is IownPaypal@gmail.com this is what you need to have in a text file (notepad) to upload to Paypal. Save it as whatever and upload it through ‘Send a Mass Payment’. 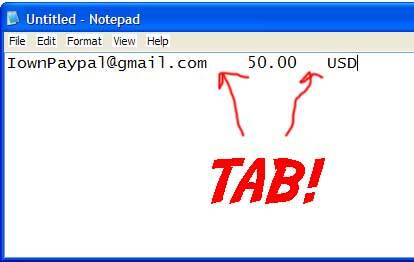 Of course change the email address, amount and currency type if you’re sending in another currency other then USD. So that’s about it! Pretty easy right? Save your friends some money and use Mass Payment, again this can be used for multiple payments or just one! 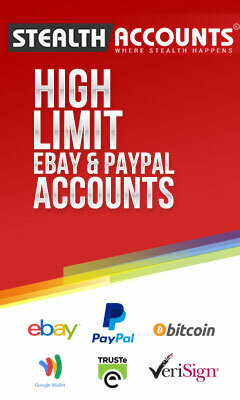 Learn more about eBay and Paypal in the eBay Suspension Forums!